SBSettings is neat and all, but can you ask it to turn on WiFi? By default, you have to pull down the SBSettings tab with a gesture and tap on the appropriate button. With WireSiri all you need to do is call Siri up and ask her to turn on or off your wireless services. Now you can use your words instead of prodding at your Phone. This tweak’s not much more practical than pressing a button in SBSettings for most users, but I can understand how this tweak could come in handy especially if you have impaired vision or motor difficulty with the Activator commands. 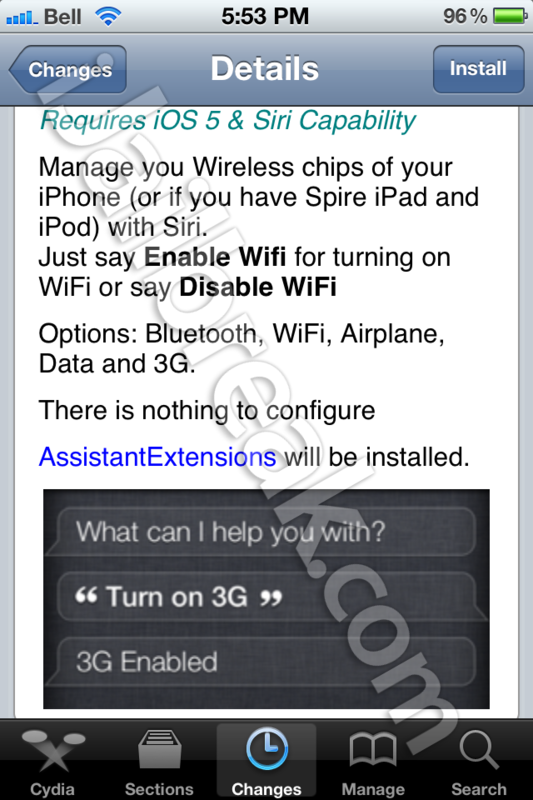 WireSiri requires iOS 5 as well as Siri Capability, and will install AssistantExtentions if you don’t already have the plugin. This tweak is available for FREE in the BigBoss repository on Cydia. There are no settings to configure; you just need to install WireSiri from Cydia and respring your device. What other voice commands do you need to feel like you’re living aboard the USS Enterprise? (I’m waiting until I can order “coffee, black.”) Beam your suggestions to the comments section below, Scotty. How To: Jailbreak Your iPhone, iPod Touch And iPad With Sn0wBreeze v2.2 On Windows.